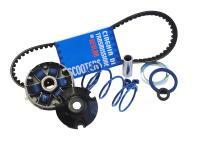 Speed control transmission kit from Polini for Piaggio engined scooters. Polinis Hi-Speed offers some of the strongest drive of any variomatic on the market. The roller surfaces make for improve transfer of power meaning increased acceleration, with less focus on the top end speed. Power you can feel, but not quite as strong as the option from Malossi and co. Makes a great everyday vario. Delivery includes: 1x set vario-rollers at 8.1 g and 1 x set of sliders.